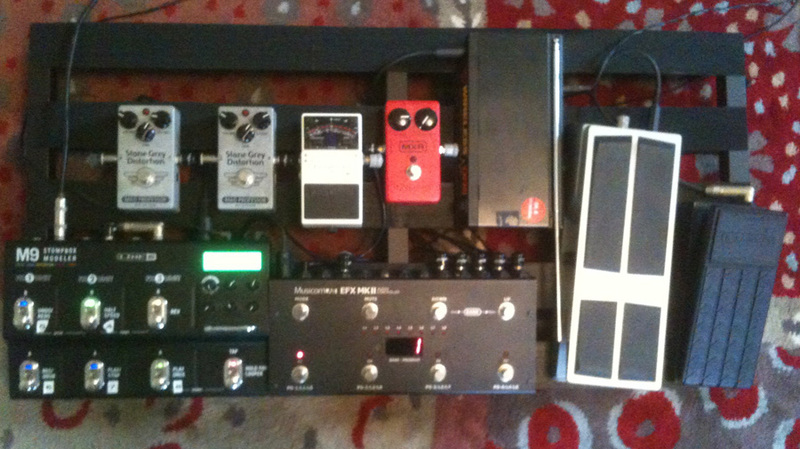 Today’s pedal line is from Chris Wood. If you have a pedal line (doesn’t have to be in a board) for your rig, please email me a photo, bio, description of pedals and routing to pedalline@nulleffectsbay.com. Every Friday I’ll showcase a pedal line submission. Make sure you include any links to your band or music page. I’ve played guitar in the Memphis power pop bands Kitchens & Bathrooms since 1994 (www.kitchensandbathrooms.net), and the Mike Dees band starting this year (http://www.door23.com/fr_home.cfm). Here is my newly revised pedalboard. It is a Pedaltrain Pro and I’m about to mount my Voodoo Lab Pedal Power Plus underneath. Nady Wireless One – When I choose to run wirelessly. If not, I can just plug from my guitar into the Boss volume pedal to start. I’ve had this unit for about 20 years and it is amazing that it still works great. It was literally the cheapest unit at the time. Boss volume pedal – Love these pedals for four reasons: 1) They don’t change your tone when you roll off the volume, 2) They are big, 3) You can adjust the effort required to move the pedal (I like relatively high effort), and 4) You can set a minimum volume in the heel position. I set the minimum volume to give a clean sound when I’m on my first level of distortion; and I often just roll back and forth rather than switching to a true clean patch. MXR Dyna Comp – I like just a hint of compression to smooth things out a little, so this is always on with the compression setting at minimum. MusicomLab EFX MkII – A (mostly) wonderful piece of gear. If these were less expensive I bet WAY more folks would use them. A fantastic solution when you want to do multiple switches instead of tap dancing. I sold my Voodoo Lab GCX/Ground Control system when I found this. It has 8 loops and MIDI control. Getting pedals in loops improved my tone. The only problem is that the MIDI CC commands (i.e. turning an effect on or off) are tied to the loop numbers. So, even though there are 8 loops physically available, you really only have a total of 8 loops or CC changes you can control at once. This is really a poor design for an otherwise fantastic (and expensive!) piece of gear. My preset buttons are generally set up: 1) Clean – straight into amp, 2) Lighter distortion (first Stone Grey), 3) Heavier distortion (second Stone Grey), 4) Solo sound (second Stone Gray plus EQ on M9 turned on with a volume/mid boost). I have some specialty banks for other songs with patches that turn off various effects on the M9. Boss TU-3 tuner – In a loop on the MusicomLab. There is a mute button on the switcher that routes signal to the tuner. Mad Professor Stone Gray – In loops 1 and 2. As described above, one is set up more dirty than the other. As probably all of your readers have done, I’ve gone through many distortions and ODs and these are totally rocking my boat right now. I love the totally flat EQ – which is easier to get away with in a band with one guitar. A lot of pedal descriptions say that they “don’t color your sound”, but these really don’t. These are marketed as heavier distortion pedals, but they work wonderfully for lower/medium gain too. They clean up wonderfully when I roll back the volume pedal. Just a great pedal. If you know the Son Volt album “Trace”, then that’s pretty much the range of distortion sounds I’m using. Line 6 M9 plus expression pedal – I can use this in two ways: 1) As 6 instant access pedals anytime I want, or 2) Turning effects on and off as part of presets by the switcher. My standard bank includes tap tremolos at different tempos (1/16 and dotted 1/16). I use the expression pedal to swell in the tremolo mix. The other four are a 1/4 note tap delay (great for basic atmosphere), a whole note tap phaser, the EQ for solos, and a reverb. I’ve never been a digital effects guy, but this unit is amazing for the price. It’s small, really versatile, it can be controlled by the switcher, the sounds are good enough for live work, and I love the tap tempo ability. The only problem I’ve found is that the tap tempo does not stay constant if you switch banks; so I typically just stick to one bank. I have nice analog versions delays, tremolos, etc., but this is so much easier and versatile right now. I usually play an ’89 American Standard Strat or a 90s Rickenbacker 360 into a 90s Vox AC30 or a Hot Rod Deluxe with a Weber speaker (the HRD for shows – lighter weight). Thanks!